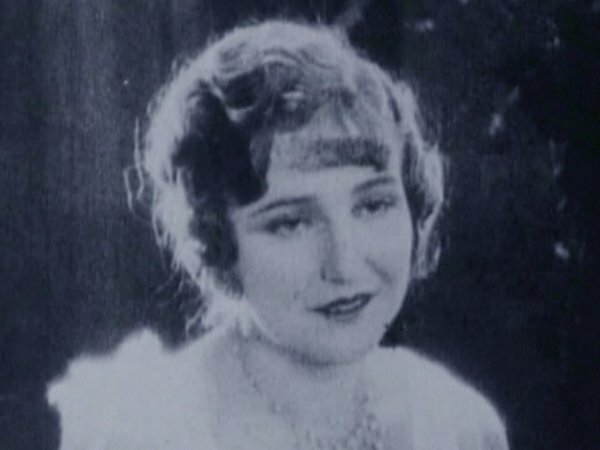 Popular American silent screen actress. At the age of 18 she worked as a bookkeeper for an electric company. Early in her career she claimed that she was about to graduate from the U of Chicago Law School and less than a year from taking the IL Bar Exam when she had to decide between movies and the bar. Later she said that she only planned to study law after high school. She had an affair with the married Jesse Lasky, which helped boost her career and salary. Though divorces, lawsuits and mental health battles all took their toll on her. Her father was Solon Agustus Henkell (New Market, VA), and her mother was Emma S. Ayres. She lived at 834 Alfred Street, Los Angeles, California. She died at 3:15am on Christmas Eve, 1940, though at least one souce claims a date of December 25. 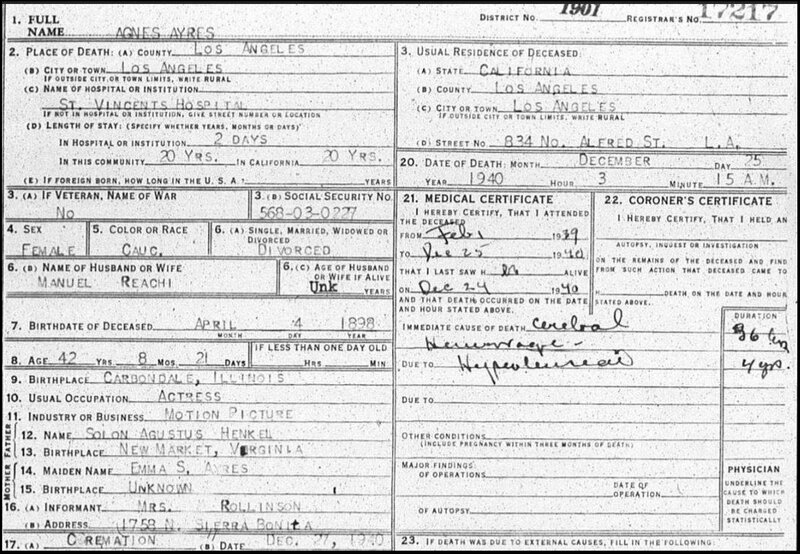 Agnes was cremated at the Hollywood Crematorium on December 27th, 1940.
https://familysearch.org/ark:/61903/1:1:MZ5W-4L2 1870 Census SOLAN A. HENKEL b. NJ. https://familysearch.org/ark:/61903/1:1:MXKG-C1N 1880 Census FRANK RENDLEMAN b. IL "commercial agent". 1899 May 6 (Carbondale, IL) "Daily Free Press p.10 has advertisement for "S A HENKEL, druggist". 1899 Nov 4 same p.1 "S A HENKEL in hospital seriously ill with bilious fever". Sick for 1 month. 1899 Nov.11 same p.1 obit for Nov.4th death of S A HENKEL. No mention of wife or kids. 1902 May 14 same p.6 "SOLVN (sic) HENKEL of Cobden (IL) spent Sun w/ his Grandpa SLACK". He is SOLON WILLIAM, bro. of AGNES. 1905 Chicago City Directory (at Fold3.com) "Franklin Rendleman, com trav, h. 1910 Washington Blvd." 1907,08,09 Chi.City Dir. (at Fold3.com) Solon Henkel, clk at 1629 Monadnock Bldg; h. 1991 W.Adams. 1907,08,09 Chi,City Dir. (at Fold3.com) Frank Rendleman, com trav, h. 1991 W.Adams. https://beta.familysearch.org/ark:/61903/1:1:MSHL-CYS 1900 Census with AGNES as RENDLEMAN dau.(sic). https://familysearch.org/ark:/61903/1:1:MK8J-DKK 1910 Census w/AGNES HENKEL as RENDLEMAN step dau..Res; 1991 W.Adams.Chicago. 1912 Chi.City Dir. (at Fold3.com) p.622 "Miss Agnes E. Hinkel, stenog; h. 3831 Grenshaw". 1912 Chi.City Dir. (at Fold3.com) "Solon Henkel, clk, 1640 Monadnock blk; h. 3831 Grenshaw. 1912 Chi.City Dir. (at Fold3.com) "Frank Rendleman, com trav; h. 3831 Grenshaw. http://www.archive.org/stream/mowor29chal#page/n593/mode/1up ...1916 one year (sic) from IL Bar exam. https://familysearch.org/ark:/61903/3:1:33S7-L14V-VBZ WWI Draft Card June 1917 of brother SOLON HENKEL b. Carbondale 1888.
http://www.archive.org/stream/exhibitorsherald10exhi_0#page/n471/mode/1up/search/%22AGNES+AYRES%22....1920 only had INTENTION to study law.